Fill large saucepan or Dutch oven with water; bring to a boil. 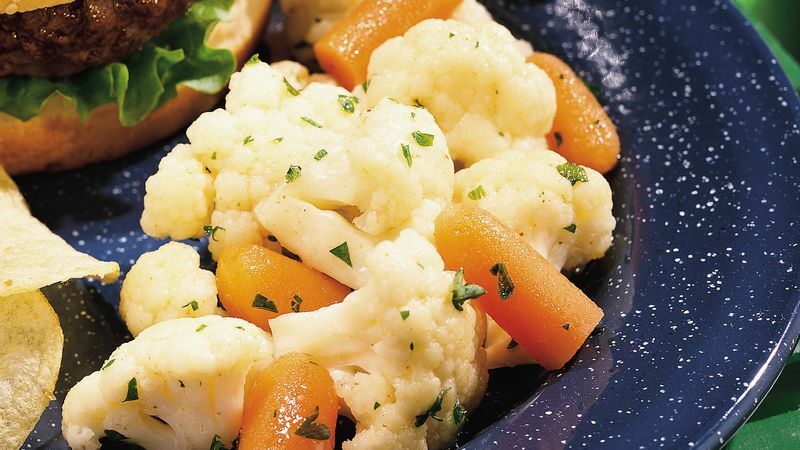 Add cauliflower and carrots; cook 2 minutes to blanch. Drain; rinse with cold water to stop cooking. Meanwhile, in medium nonmetal bowl, combine all remaining ingredients; mix well. Add cauliflower and carrots; toss to coat. Refrigerate at least 3 hours before serving, stirring occasionally. The flavors of Moroccan cooking inspired this salad. Carrot salads are popular in Morocco, where parsley, lemon and cumin are common seasonings. Cauliflower belongs to the cruciferous family of vegetables, as does broccoli, Brussels sprouts and cabbage. These vegetables contain anti-oxidants, which may reduce the risk of cancer. Cauliflower is also high in fiber.